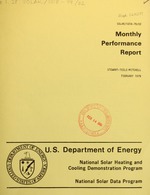 National solar heating and cooling demonstration program. "SOLAR/1018-78/11" ; "SOLAR/1018-79/01" ; "SOLAR/1018-79/02" ; "SOLAR/1018-79/05." process disclosed, or represents that its use would not infringe privately owned rights. The Stewart-Teele-Mitchell site is a single-family residence in Malta, New York. that delivers solar energy from the collector array to a heat exchanger. schematically in Figure 1, has five modes of solar operation. loop. Collector loop pump P1 and storage loop pump P2 are operating. the air-handling system. Mode diversion valve V2 is open. 100F. Pump P4 is operating. dwelling. Valve V1 directs the collector loop flow through a purge unit. savings of 2.2 million Btu at an electrical energy expense of 0.2 million Btu. as low as -19F. Data was lost for three days in February. February was 130F as compared with the long-term average for February of 240F. was 1308, as compared with the long-term average of 1162.
energy collected was 3.5 million Btu versus an estimated 6.1 million Btu. the collector loop was 0.13 million Btu. s'oirait, tLcl,''irIAture for the month was 880F. was .onsiiied at an average temperature of 1260F delivered from the tank. resulting in an electrical energy expense of 0.058 million Btu. exchanger loop was almost normal. best performance of the winter season. electrical energy expense of 0.06 million Btu. anomalies has not been scheduled by Boeing. "o. 'Pl TI Ci qN RTr! 0.047 A I 0.0C6 I 0.fl . 0.070 1I n. n I n n.o01 . 0.06? 0.006 I ."^? . N.A. DE nTFoS I'OT APDLTCARLC nATA. SO.0 0.106 1 oI 0.
n^.o C nr .nc I 0. N.A. nFNOnTF MHT ADOLICABLF n'TA. N.A. O)EFITES N]OT APPLICABLE r)ATA. N.A. DENOTES NOT APPLICABLE nATA. N.A. DENOTFS NOT APPLICABLE rATA. RTII/S.cn, T p TI1f(n.r T I OFr. F i nr c OFaru "
N.A. r)FNOTiS NOT APPLICARLF nATA.